Today, December 31, 2014, it has been 300 days since John died. I know this has been hard for everyone involved on all different levels but I feel I can truly say I knew him first. 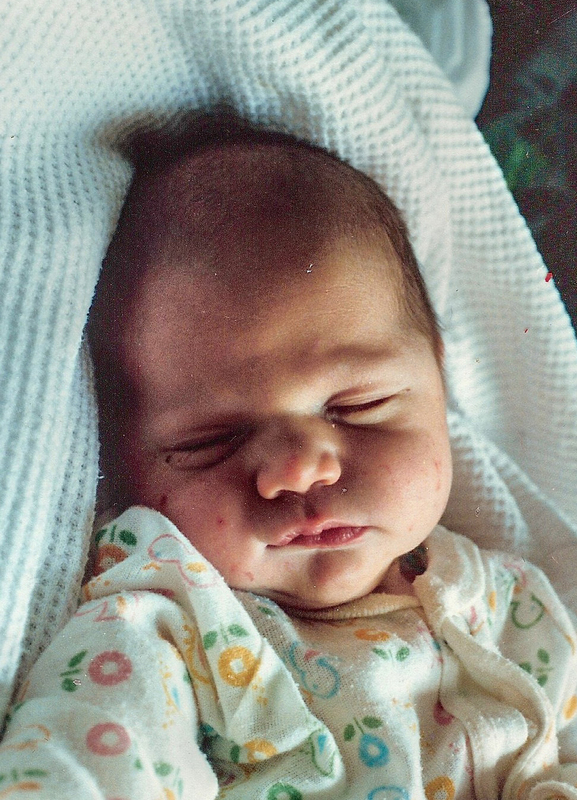 31 years ago I felt his body moving in my body. It was an easy pregnancy. He was an easy going baby. I nourished his body with my own for those nine months and then nursed him for another 6. I have had numerous mothers, both counselors and my GP all tell me that it is always harder for the mom to lose a child. I believe that Hallmark could sell a lot more cards if, instead of celebrating all mothers in the spring on Mother’s Day, we were to acknowledge mothers on our birthdays. I know this year, on January 17th, his 31st birthday, I am going to be thinking of my part in bringing a wonderful person into the world who will never know the change he has created, both before and after, the lives he touched and the personal hurt I feel, as his mom. My meditation leader gave me the advice to give metta to all mothers who have lost sons to kayaking accidents as a way of holding them in my heart and sending them loving kindness during my meditation. I don’t believe that they would be able to feel my message and I think part of the practice is to help me to realize that I am not alone on this journey. I can think of them and their suffering . I often wonder how they are dealing with their loss. Are they angry? Do they wish they could talk to their son? Do they wish their son would have seen the danger they put themselves into? I wonder if they have the same frustration that I have of wanting to talk to my son, to find my missing son. If they have had a day where you get the same feeling you had when that child would play hide and seek in public and the panic you feel, only to find them and be angry and happy at the same time. Only now, that panic never resolves itself. If they are angry at their son for being arrogant and not recognizing how powerful water can be, thinking they are capable of coming out alive. If they are angry at all those other young men who are still putting their own lives in danger not thinking about the pain and suffering their deaths will create. I think of the mother in WVA who’s son, Chris Schwer died in 2012 and how she is just now reaching her 1000 days. How many more mothers have to do this? We got two more years than she did. Do I want a relationship with her or those other mothers?…..no. Not one single book that I have read for grieving parents says it gets better. I don’t see how it ever will. I think it will get easier but never better. How can it? I feel my life is now a sandwich that is just bread. And it is that awful white bread that has no taste. There is the first slice of bread that represents everything before John and a slice of bread that represents this new chunk of life without John. The middle 30 years of my life has been removed. Not all of it, but a huge part of it. Now, I have to find the “meat” to life or the PB&J, as it were. Something to fill the emptiness. I am learning through reading about mindfulness and meditation that I need to find a way to “awaken” and allow things to be as they are right now. To be grateful. To learn to not judge and to let go. I don’t feel I am getting very far.I am still judging, I am still very upset, I am still frustrated. I have a lot of trouble “letting go.” I am reading a book by Tara Brach called True Refuge. The book has given me meditations to try to work through my tough days and is something that I am trying to do daily to retrain my brain’s neurons. Together with Rick Hanson’s book, Buddha’s Brain and information about our brains and how they work, I am hoping that I can train my brain to deal with all the parts of the process and will hopefully come out the other side a different person. A better person. One that can live with the constant ache in my heart but realizes that I have to continue. I have no other choice. This is my best plan to cope given that I don’t believe there is any higher power that can help me through this or can make it all make sense. The phrase that is a constant both with Rick and with Tara is that “neurons that fire together wire together” and I am hoping that I can awaken the bad neurons and replace them with better ones that know how to move forward. Giving myself positive affirmations to heal historic wounds that have come along for the ride. Sometimes grieving my son feels like looking at a webpage. The main body of the page is the grief that Herb and I share. There are many embedded links in that body of grief. Many issues from our collective pasts that influence our sharing of our loss. That part of the page is full in and of itself. Then it gets even more complicated with the sidebars on the page. Under each of those links are the other persons whose lives have been touched by John. Those links are hard to click on sometimes because, just like a webpage, they take you into places that you didn’t even know existed. Places that don’t add any value to the healing or the “getting easier” part. And just like on the web, places that aren’t even related to the subject but are just distractions. I had a customer stop in who shared that her brother had died in his 20s. Her mother had a hard time the rest of her life. The customer commented that as 20 somethings, they couldn’t understand why their mom still grieved for their brother. They would say to each other, ” she should be past this by now”. But, as they got older and they watched their own kids grow up, only then did they understand their mother’s grief. They couldn’t imagine watching their own child grow into adulthood, be at the start of adult life and then losing that child. Tomorrow starts 2015. Tomorrow, when I move a pebble, I will be able to look at the calendar and use the day number as my number of pebbles, at least for 31 days on the way to 700 more days to acceptance. Yesterday, I counted the pebbles in my jar. I counted them twice. 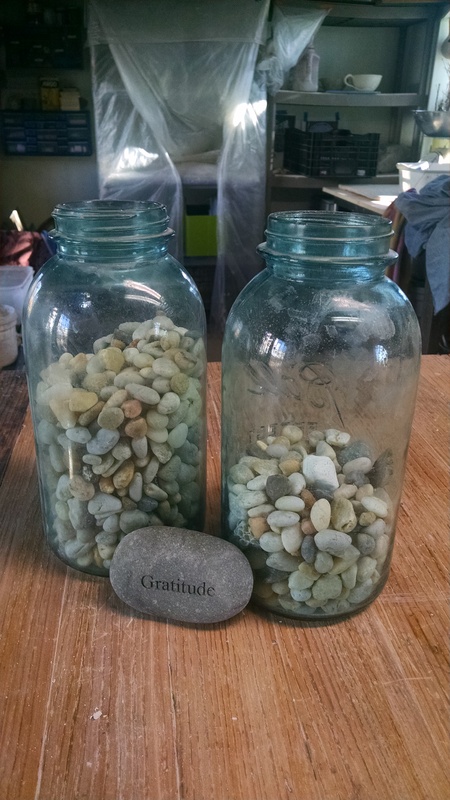 As with other times of counting, I got to add extra pebbles to the jar. Bonus pebbles. There are 2 pebbles that an acquaintance sent me to add to my jar, (one of John’s college room mate’s mom) some driftwood and beach pebbles from Whidbey Island when we went to the west coast last summer, and a large pebble that I picked up the day we walked by the Rouge river with John after driving across the country with him. The large Gratitude stone in the photo was given to me by a good friend so that I remember each day to be grateful. Thank you everyone for helping us get through these 300 days. 700 more to go…I am grateful for my friends. I am grateful for small things. I am grateful that I had John and that we got to enjoy him for 30 years. I just wish it had been more.